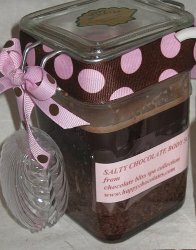 Who would have thought you could not only eat chocolate but you can use it as a body scrub? This amazing craft is yummy and helps out with your skin. Make as many as you wish and give them as Christmas gifts in a jar. It works best at the end of a hot bath. Use a food processor or blender to grind the oats into a powder. Add the cocoa nibs, cocoa powder, salt, almond oil, jojoba oil, and vitamin E oil. Hit pulse a few times to blend. Store in a glass or plastic jar, and scoop out for use with a spoon or a seashell. Massage the scrub into skin, then rinse with warm water. I would guess omitting the cocoa nibs would be okay and the product will still work but with a simple google search I was able to find more than one place to purchase them. Unfortunately all of the outlets to purchase them were mail order. My mantra is if you can not eat it then you probably should not put it on your skin. I think this is an amazing recipe for body scrub and I promise you one thing, I will either be sharing the recipe by making and gifting or forwarding the recipe. I am really excited about this and I appreciate the share. @Silverchakra, If you do a search online you can find where to buy them locally, but they are sold at vitamin and raw food stores. And of course, as with anything, you can buy them online! There was never an answer to the question someone posted about where to purchase chocolate nibs. Could the author of this recipe please respond to that? Thanks! My daughter and I agree - this might never make the bath! Vitamin E and Sea Salt are natural preservatives. Sea Salt is a bit rough on the face and not recommended. Does this concoction need a preservative? thanks for the description but, where do we find them? Cocoa nibs are simply roasted cocoa beans separated from their husks and broken in to small bits. They are a new chef favorite! They add chocolate flavor without any adding sweetness. Forgive me for sounding dumb, but just exactly what are cocoa nibs? Chocolate chips? Uhhhh what is a "cocoa nib"?????? ?